March is where I had my first collaboration project for the year 2013. Me and a few other selected bloggers were chosen to collaborate for a Shu Uemura project. It was really fun and they even took a photo of me and display it on their counter along with my testimonials. It was a fun experience indeed. This month also marked our "Project Apt", it has officially started! This month my blog has officially changed its address to >> www.twothousandthings.com << Yay! 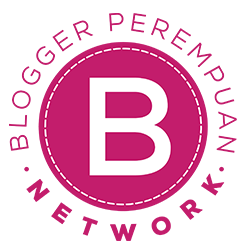 It was a big benchmark for this blog. 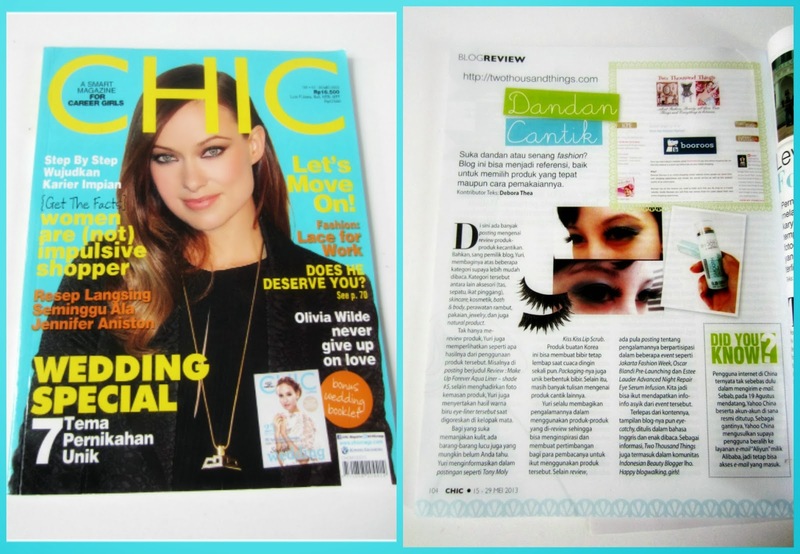 Another special thing also happened to this blog: Two Thousand Things was Featured in CHIC magazine! WOW, what a surprise for me. It's the second time I made it into local magazines. Last year, it was only one of my photo with a credit to my name in Go Girl magazine, and now it's a one page feature of my blog: Two Thousand Things. Super awesome! Thank you GOD. Hubby K went to Kalimantan this month to visit one of his office's site, an experience that he had wanted since the first time he moved to this office. My stint as a translator for Mahligai magazine still continues :) Alhamdulillah. And then our apartment is finally ready after the renovation! - We even spent a night there for the first time! Sadly, we must say goodbye to a few of our relatives. These past few months I already lost 3 of my relatives. Two of them were my cousins, and the other one is my husband's uncle who we respect so much :( - I hope there will be no more goodbyes like that in the near future, Amen. This month I was honored to be selected as one of the KBJ Stars for Kawaii Beauty Japan, a one-stop media where you can learn all about Japanese beauty and culture. The KBJ Stars are like the resident blogger for Kawaii Beauty Japan (KBJ). I also won my first Instagram contest, it was held by Monospace and I won a voucher which I redeemed for the white rose necklace and a t-shirt for hubby. It's Ied day! We spent the first few hours in the morning at Jakarta and then went straight to Bandung in the afternoon. This month I was also delighted to found out that Uniqlo is finally here (so many brands coming to Indonesia now, I'm so happy) - and I am in love with the uniqlo printed pants because I finally found the perfect pants for petites like me! I also got an invitation from Coach this month which sadly I couldn't attend. Another fashion invitation from Karen Millen that I have to passed because sadly I couldn't attend. H&M finally opens! Yippikayee.. And there's one near my area (in Pondok Indah Mall), yay! This month I won another instagram contest which is the FashioneseDaily and X.S.M.L for their "Made in Indonesia" contest as juara hiburan (consolation winner), the prize is XSML accessory (awesome necklace). I also won the FashioneseDaily & Panasonic instagram Re-gram contest with a prize of Panasonic electronic mascara. This month I was also asked by Vanity Trove to join them as one of their VT Top Influencer. This month I also took another freelance job opportunity with the Albatross Mystery Shopper Service (for cosmetic brands). Alhamdulillah..
As the year closes, I have another new sponsor for this blog which is a very nice way to end the year and start the new year. In December I also decided to finally change the whole layout of this blog and create a new one as a fresh start for the year 2014. Winning five quizzes/competitions (the Femina quiz, winning the MonoSpace instagram contest, the Dove blog competition, winning the Fashionese Daily / XSML instagram contest, and another instagram contest from Fashionese Daily / Panasonic). A new freelance job as a translator for a popular national wedding magazine. Joining the Kawaii Beauty Japan as their KBJ Stars, as well as joining the Vanity Trove as one of their VT Top Influencer. Featured in a one-page article in CHIC magazine. Featured / integrated in the Coast app for ipad. Finally changed the whole layout of the blog after more than four years. I felt so lucky to have so many achievements and great highlights through out the year 2013. 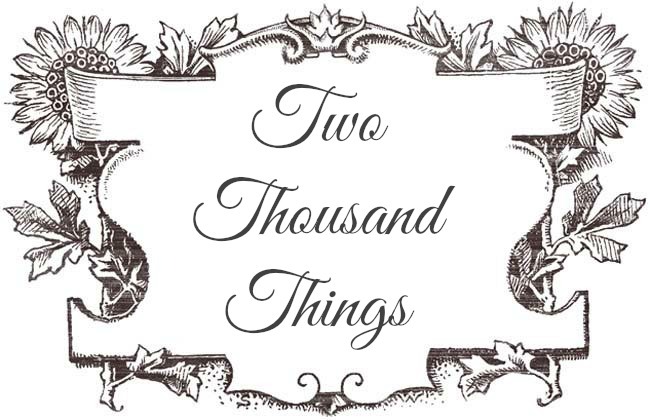 It has been a great journey for me, hubby K, and also for this blog: Two Thousand Things. I can't believe the many things that this blog has achieved. It just keeps on escalating with many great opportunities. I never imagined that this blog would be this far. I know it's not a popular blog yet (and I'm not aiming to be popular either), but I treat this blog as my baby, so I couldn't help to feel happy and proud with every progress and development this blog has grown into. I wanted to thank all of you who have read my blogs, who have followed or subscribed, and to those of you who have kindly stopped by to read my posts, commenting on them, and also interacting with me in my instagram, twitter, and facebook. Surely, this blog can't be here if not because of your supports. So here's to hoping that year 2014 would be another success for all of us. My hope is to reach those goals and dreams that I have been saving in my head. To put my feet forward and not be shy anymore to grasp more opportunities. 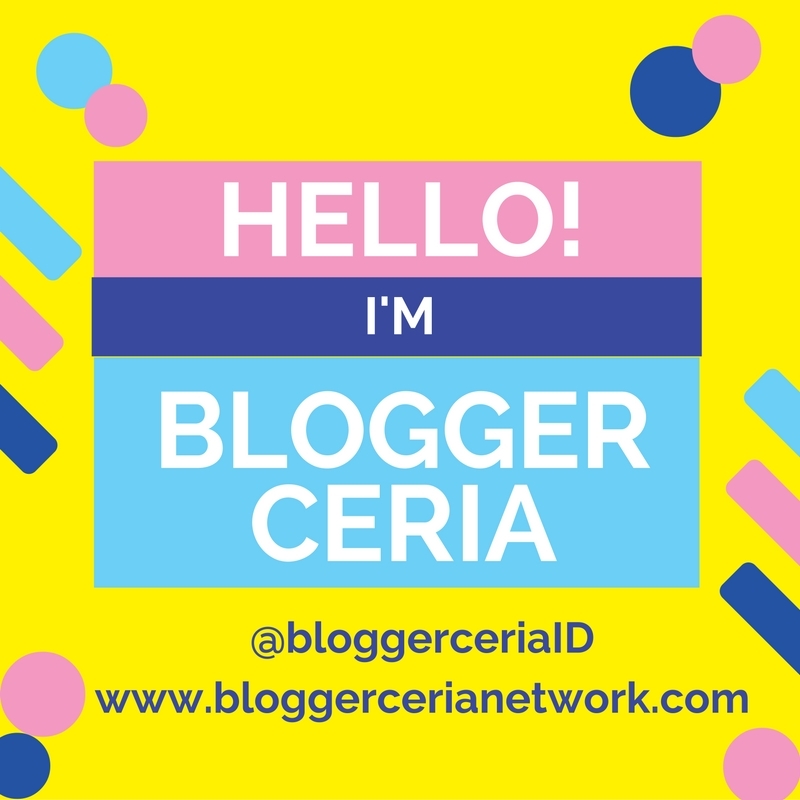 My wish is for this blog to develop even more and hopefully can gain more achievements as well as giving more useful information and as a fun place for you to read. I hope that this blog can at least inspire you somehow.. Thank you 2013, and welcome 2014, please be nice!